Every year, the Krewe of Muses honors one distinguished woman with New Orleans connections who embodies the spirit of Muses. 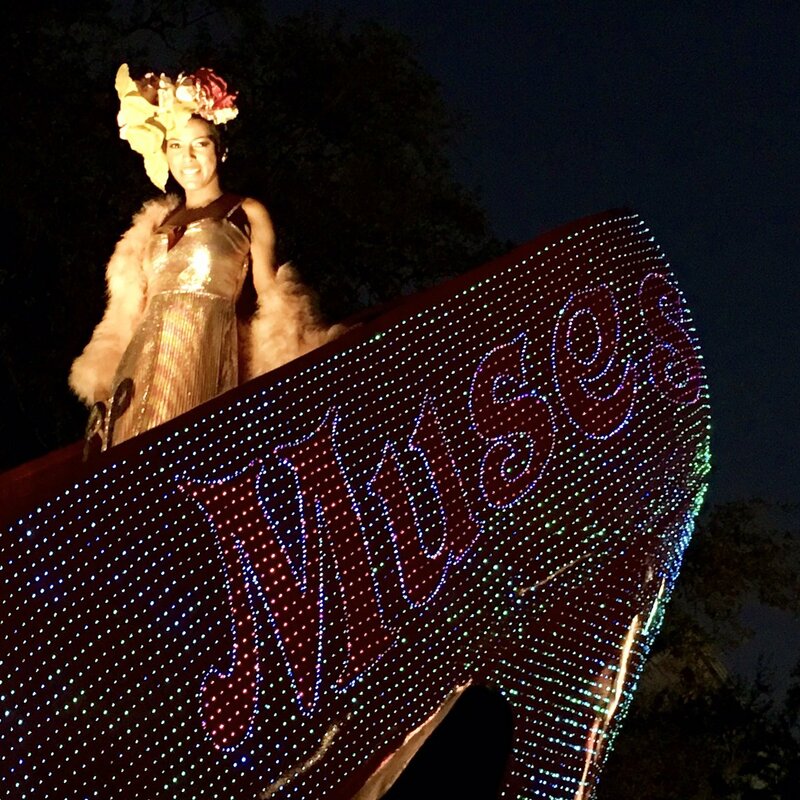 The Honorary Muse earns a coveted position in a 17-foot tall, fiber optic, red high-heel shoe at the beginning of our parade. These women have distinguished careers and inspire New Orleans women and future Muses, and we are honored to have celebrated Muses Thersday with these goddesses. Goddess Tamron Hall leading the 2016 parade. Photo taken from Tamron Hall’s Twitter account. Tamron Hall is an award-winning journalist who has anchored for NBC News, MSNBC, the Today Show, and Investigation Discovery channel. She is also known for her anti-domestic violence, housing, and education causes through Day One and Safe Horizon’s The Tamron ♥ Renate Fund. Hall has been nominated for two Emmys, one of which she won for the NBC News segment “The Inauguration of Barack Obama.” In 2016, she won an Edward R. Murrow Award for her coverage of domestic abuse. Knowles is a goddess of many talents. She is a world-renowned singer, songwriter, actress, and founder of record label Saint Records. Locally, she is involved with the Make It Right Foundation and Son of a Saint mentorship program. Her music career, including albums Solo Star, Sol-Angel, and the Hadley St. Dreams, and A Seat at the Table, has been distinguished with awards and honors from the Grammy Awards, ASCAP, BET, the NAACP, and the Edison Jazz-World Awards. Chef Sue Zemanick is a force to be reckoned with in the culinary world. Originally from Pennsylvania, she graduated from the Culinary Institute of America and became a chef-instructor at the prestigious school. In 2003, Zemanick moved to New Orleans and first worked in legendary Commander’s Palace before moving to Gautreau’s. She is credited with propelling Gautreau’s into the national spotlight for seafood and contemporary American cuisine. Awards include three James Beard Award nominations, a James Beard award for the best chef in the south, Food & Wine’s “Top Ten Best Chefs in America” in 2008, and a spot on television show Top Chef. When Zemanick rolled in the honorary high-heeled shoe, she was the executive chef at Gautreau’s but has since left the restaurant. Julia Reed, a native of Greenville, Mississippi and resident of New Orleans, has written five books and served as an editor for Newsweek, Vogue, The Wall Street Journal, Elle Decor and Garden & Gun. Her diverse work includes profiles of Oscar de la Renta, Sister Helen Prejean, Bill and Hillary Clinton, and George and Laura Bush, as well as political musings and witty commentary on southern life. Reed has served on the board of the Ogden Museum of Southern Art and the National Advisory Board of the Eudora Welty Foundation. She resides in the Garden District and is active in supporting the arts. New Orleans native Patricia Clarkson will serve as the Krewe’s first Honorary EveryMuse. Clarkson is a woman that demonstrates the attributes of all nine muse sisters and as a native New Orleanian, she is an inspiration to all New Orleans girls and future Muses. Patricia is an Emmy Award winning and Academy Award nominated actress who has appeared and starred in countless film, television and theatre productions. A New Orleans native, Patricia is the daughter of Arthur Clarkson and Jacquelyn Brechtel Clarkson. After earning a Master of Fine Arts from the Yale School of Drama, Clarkson made her Hollywood debut in 1987 as Mrs. Eliot Ness in “The Untouchables”, acting opposite Kevin Costner. She has appeared in critically acclaimed films including, “Cairo Time”, “The Green Mile” and “Shutter Island”; television shows such as “Six Feet Under”; and theatre productions including, “The Maiden’s Prayer” and “A Streetcar Named Desire”. Matalin has served as a political advisor and strategist for several presidential administrations, authored two national bestsellers, and hosted her own critically acclaimed television and radio public affairs shows. She currently serves as a CNN contributor and the Editor-in-Chief of the Simon and Schuster imprint, Threshold Editions. Mary and her husband, political consultant James Carville, moved to New Orleans with their two daughters in 2008 and quickly became involved in the City’s community affairs and rebuilding efforts. She serves on the boards of the Academy of the Sacred Heart and Bureau of Governmental Research and is a member of Women of the Storm. Strong supporters of New Orleans and its promising future, Matalin and Carville were chosen as co-chairpersons of the 2013 Super Bowl Host Committee. Kim’s performance in the movie has been lauded on a national level and the film was on many end-of-the-year top ten lists. Her indomitable spirit and her unstintingly honest and cogent observations about her experience reveal her as one of the heroes of Katrina and a role model for all women on how to rise above horrific circumstances and truly succeed. Known as Louisiana’s Blues Queen, “Marvelous Marva” is a gospel and soul powerhouse. She has performed in venues all over the world – including the U.S., France, Italy, Germany, Belgium, Holland, Russia, Norway, Sweden, and Brazil. Wright has collaborated with many talented musicians including Harry Connick Jr., Bobby McFerrin, Aaron Neville, Fats Domino, Lou Rawls, and Marcia Ball. Brenda Marie Osbey, the Poet Laureate of the State of Louisiana, has taught numerous literature subjects around the country and has twice been appointed visiting writer-in residence at Tulane University and scholar-in-residence at Southern University. She has conducted seminars and colloquia in literature, creative writing, and New Orleans black culture. A native of New Orleans, Brenda is the author of All Saints: New and Selected Poems (LSU Press, 1997), which received the 1998 American Book Award. She is the author also of Desperate Circumstance, Dangerous Woman (Story Line Press, 1991), In These Houses (Wesleyan University Press, 1988) and Ceremony for Minneconjoux (Callaloo Poetry Series, 1983; University Press of Virginia, 1985). Her poems have appeared in numerous journals, anthologies, and collections.